To mark the 150th anniversary of the London Underground, here is a piece I wrote for Time Out in 2007. It was, on the face of it, a stupid idea. Running trains, and steam trains at that, in tunnels underneath the London streets. In 1862, the Times described it as an ‘insult to common sense’ and it was probably right. But the London Underground turned out to be one of the great engineering feats of modern times, the world’s only steam-driven underground railway and the first electrified underground railway. A socially egalitarian and liberating phenomenon, it helped drive London’s rapid expansion and got people to work on time, while providing the city with a bold new identity through impeccable branding that incorporated iconic typography, cartography and architecture. It’s fair to say that the Underground remains unloved by Londoners, and it would take a more dishonest contrarian than I to defend the grime, the delays, the heat, the way it’s so busy and unreliable and the fact that, year after year, we are asked to pay more for a service that doesn’t seem to be getting any better, cleaner, quicker or cooler. But that’s a fault of management and decades of underinvestment, not of a system that remains something Londoners should treasure as remarkable, groundbreaking and emphatically ours. The story began with Charles Pearson, the first in a succession of underground visionaries. It was he who first proposed the notion of ‘trains in drains’ in 1845, when the railway was a relatively new invention (the first steam passenger service only opened in 1830). Pearson, instrumental in the removal of the anti-Catholic inscription on the foot of the Monument, was a progressive and a pioneer – his persistence helped persuade the House of Commons to approve a bill in 1853 to build a subterranean railway between Paddington and Farringdon. The reason such a hare-brained, experimental scheme received approval was one of necessity. London roads were suffering from terrible overcrowding and the mainline railways all stopped on the fringes of the West End and City thanks to a Royal Commission of 1846 that declared central London a no-go area for railway companies. A method of linking the mainline stations of Paddington, Euston and King’s Cross was needed, and Pearson’s plan fitted the bill. He helped raise the finance from private investors and the City of London, and excavation began in 1860, with a shallow trench dug beneath Euston Road and then covered over. Thousands of poor residents were displaced in the process. The Metropolitan Line opened for business on January 10 1863, clocking 30,000 passengers on the first day. A celebratory banquet had been held the previous day at Farringdon. Pearson was not among the guests, having passed away the previous year. Another absentee was Prime Minister Lord Palmerston, who was approaching his 80th birthday, and said he wanted to spend as much time above ground as he possibly could (he died two years later). The Metropolitan was a success, with 11.8 million passengers (the population of London was about 3.2 million) braving the foul, smoke-filled conditions in its first year. The Metropolitan’s owners claimed the ‘invigorating’ atmosphere ‘provided a sort of health resort for people who suffered from asthma’, but they also allowed drivers to grow beards in a futile bid to filter out the worst of the fumes. A civil servant who had spent time in Sudan said the smell reminded him of a ‘crocodile’s breath’. One attempt to improve conditions saw smoking banned, until an MP objected and insisted that all railways provided a smoking carriage. Smoking was not banned again on the trains until 1985, and at stations until after the King’s Cross fire of 1987, itself the culmination of 30 years of neglect. Among those to benefit most from the new railway were the lowest-paid workers, who were entitled to use a special, cheap pre-6am train. Social journalist Henry Mayhew interviewed some such passengers in 1865, first explaining that ‘this subterranean method of locomotion had always struck us as being the most thoroughly Cockney element of all within the wide range of Cocaigne’. The labourers he spoke to all voiced their enthusiasm for a service that allowed poorer Londoners to live further out, sparing them a six-mile walk to work and allowing their families to live in two rooms rather than one. As the Metropolitan expanded westwards, it opened up new areas for Londoners to move to, and the overcrowded city d slowly started to expand – one of the reasons that London still has such a relatively low population density. When Hammersmith received its first station in 1864 it was still a village ‘best known for spinach and strawberries’, writes Christian Wolmar in his definitive ‘The Subterranean Railway’ (2004), but it soon became a major interchange. This pattern was repeated throughout the Underground’s history. When the Northern Line hit Morden in 1926, it was a village of 1,000 inhabitants; five years later, its population was 12,600. The success of the Metropolitan led to the building of the District Line along the Victoria Embankment, and then the creation of a Circle Line to link the two. Unfortunately, the two east-west lines were run by rivals, James Forbes and Edward Watkin, whose perpetual bickering meant the Circle took twenty years to complete. When it was finished in 1884, Watkins’ Met operated trains that ran clockwise, while Forbes’ District controlled those in the other direction; such was the antagonism between the two, the companies refused to sell tickets for their rival line, meaning a passenger might end up paying for 20 stops rather than seven. When the Circle was finally electrified in 1905 the companies used different systems which proved incompatible, resulting in a further three-month delay. Because the Underground was built haphazardly by private investment and with no central planning, there were many such inconsistencies. Some destinations had more than one station, built by competing interests, which explains why there is such a poor interchange at Hammersmith between the Hammersmith & City and District Lines, and why Oxford Circus has two different surface stations on either side of Argyll Street. This is also why there are so many ghost stations on the network – about 40 – built without adequate knowledge of whether they were actually needed. The completion of the Circle Line marked the last of the sub-surface lines, built by the simple, cut-and-cover method. Advances in tunnelling and the use of electrified rails now allowed for the building of deep-level lines that gave birth to the phrase ‘tube’ and allowed London’s network to really connect the dots beneath the capital. The first was the cramped City & South London line from City to the Elephant & Castle, later incorporated into the Northern Line, which was opened in 1890 by the future king Edward VII. This was followed by the Waterloo & City, Central, Bakerloo, Piccadilly and Charing Cross, Euston and Hampstead (now the Charing Cross branch of the Northern), all before 1907. This splurge of lines occurred within a narrow window of opportunity after the invention of suitable tunnelling technology and before the appearance of the motorised bus. It was aided by gullible investors (who never quite received the returns they were promised), public demand and London’s favourable geological conditions – the capital’s clay being an ideal substance through which to tunnel. Several of these lines were built by American financier Charles Tyson Yerkes, who also controlled the District and was the first person to attempt to realise a unified vision of London’s chaotic underground network. A property speculator with a questionable reputation (he served time in prison in Philadelphia for embezzlement) Yerkes put together numerous complex financial schemes to get his lines built, often using capital from the States, but never got the chance to cash in on his success, dying in 1905. Yerkes left an extraordinary legacy. While lines such as City & South London never proved popular with the public – something that had much to do with the fact that the trains, or ‘padded cells’, were built without windows because the manufacturers figured there was nothing to see down there – his Central Line was a hit. This was largely because, like the Metropolitan half a century before, it served major transport routes, relieving strain on crowded streets above. There were drawbacks – the line followed the road pattern because the tunnellers didn’t want to pay compensation to surface landowners, so there were unnecessary kinks – but the Central Line was a groundbreaking service, attracting 100,000 passengers daily. For a start, it only had one class of travel, and one price, hence the nickname the d d Twopenny Tube. It also had some innovative engineering aspects (each station was built atop a slight incline, meaning trains naturally slowed when entering stations and sped up when leaving, while the flat face of the train pushing air in front of it provided much-need ventilation) and carriages were considerably plusher than on the City & South London. Yerkes’ desire for a unified service also led to the introduction of what can be seen as the first attempt at branding on the tube – the Leslie Green-designed distinctive dried-blood-coloured tiles of the surface stations – something pursued by the man who followed. Frank Pick began working for Yerkes’ Underground Electric Railway Limited (UERL), which owned all the underground lines other than the Metropolitan and the Waterloo & City, in 1906. Over the next 30 years, in partnership with Lord Ashfield, general manager of UERL and future chairman of London Transport, he helped make the tube the ‘most famous and respected transport system in the world’. Historian Nikolaus Pevsner believes Pick’s accomplishments to be greater still: in 1942 he described him as ‘the greatest patron of the arts whom this century has so far produced in England and indeed the ideal patron of our age’. He is certainly one of the few transport gurus to have met Stalin, Hitler and Churchill. Pick’s reputation was based on his eye for design. He introduced the roundel, borrowed from the London General Omnibus Company, but made famous by the tube; he asked calligrapher Edward Johnston to design the tube’s unique font; commissioned beautiful posters by Man Ray, Graham Sutherland and Edward Nash; introduced each line’s distinctive patterned seat-covers or moquettes; appointed architect Charles Holden to design modernist stations, most famously at Arnos Grove; and in 1931 he paid Harry Beck five guineas to come up with a new kind of map that would simplify the most complicated transport system in the world. All the while, the tube continued to spread east, west, north and even – occasionally – south, and was by 1934 carrying 410 million passengers a year. Pick can be said to be as responsible for the image London projects around the world as Christopher Wren, George Gilbert Scott or Norman Foster. Even today, Transport for London is well aware of the value of the brand, and jealously guards icons such as the roundel and Beck’s map from even the most loving of imitators. Pick’s definition of the tube did not end there. In tandem with Lord Ashfield, he also arranged the integration of London’s various transport systems in 1933 under the umbrella London Transport, ensuring that an underground network that had hitherto been privately funded and unprofitable became publicly supported, thanks in part to Leader of London County Council (and Peter Mandelson’s grandfather) Herbert Morrison. Finance has always been the failing of the tube, largely because, as Wolmar astutely points out, the early railwaymen ‘were building a fantastic resource for Londoners whose value could never be adequately reflected through the fare box which was their only source of income’. This was as true in the days of private entrepreneur and public ownership as it is with today’s uncomfortable mish-mash, the great experiment of the Public Private Partnership. All too briefly London Transport papered over this failing through a combination of Ashfield and Pick’s acumen and the fact that, following the depression, there was greater confidence in public ownership, and more skill in the manner with which it was executed. But this was soon diluted with World War II (in which the tube played its own valuable role), after which, rebuilding the country took precedence. Which, more or less, is where we are today. The tube has acquired only two new lines since Yerkes’ frenzy: the Victoria, which took 20 years from planning to opening in 1968, and the Jubilee, hewn in part from the Bakerloo Line and extended magnificently in 2000. Years of under-investment have taken their toll, and the system looks haggard and worn. Recent years have seen some improvement, but the cost to users has soared. Even the ongoing improvements leave the system, temporarily at least, worse off – with stations closed for months and entire lines closed weekend after weekend, reinforcing the public’s lack of sympathy for this ancient marvel. So it’s no wonder that we look upon the city’s mighty works and despair. But perhaps we should, every now and then at least, reflect on what the city would be like if the tube had never existed, be thankful for the visionaries of the past, and hopeful that their legacy will once more receive the attention and adulation it deserves. Ever since the British Library’s London map exhibition in 2007, London museums have learnt to love cartography. The Museum of London’s Hand-Drawn London was a highlight of 2011, and now the London Transport Museum has joined the cool kids with a brilliant new Mind The Map exhibition. This traces the relationship between transport and maps over the past 150 years or so and offers a brilliantly edited selection of material from the archives. The exhibition space at the museum isn’t vast, but the way it has been used here is superb. The twin focus is on the work of McDonald Gill and Harry Beck. Gill created the Wonderland map, a gorgeous, highly detailed map of London aimed at transport users. Here’s one of his, for Hyde Park. 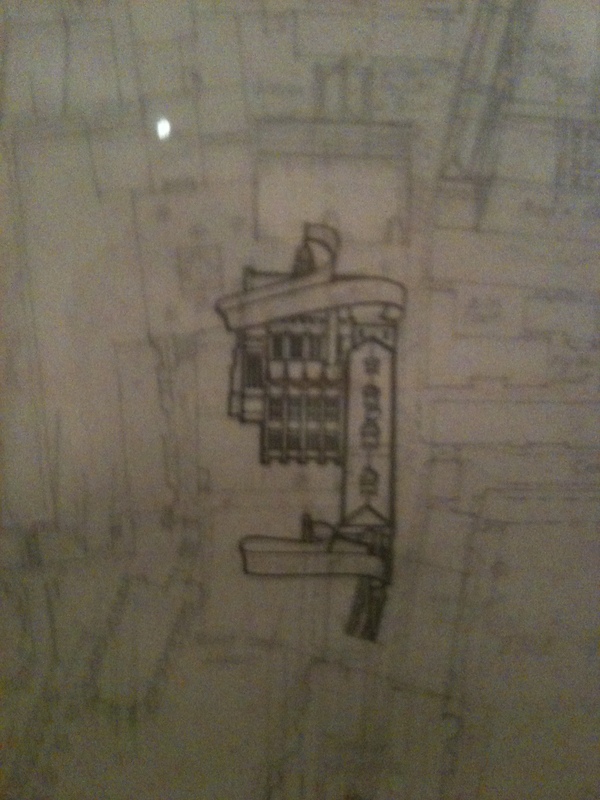 The exhibition features a number of maps created by Gill – the brother of sculptor Eric Gill – and also this fascinating unfinished map of Temple, showing his working method. He begins with a serious flat plan of the city, before building up layers of impeccably detailed architectural illustration. Then on top of that go the speech bubbles, puns and references that make his maps so fascinating. Please excuse my poor photography. 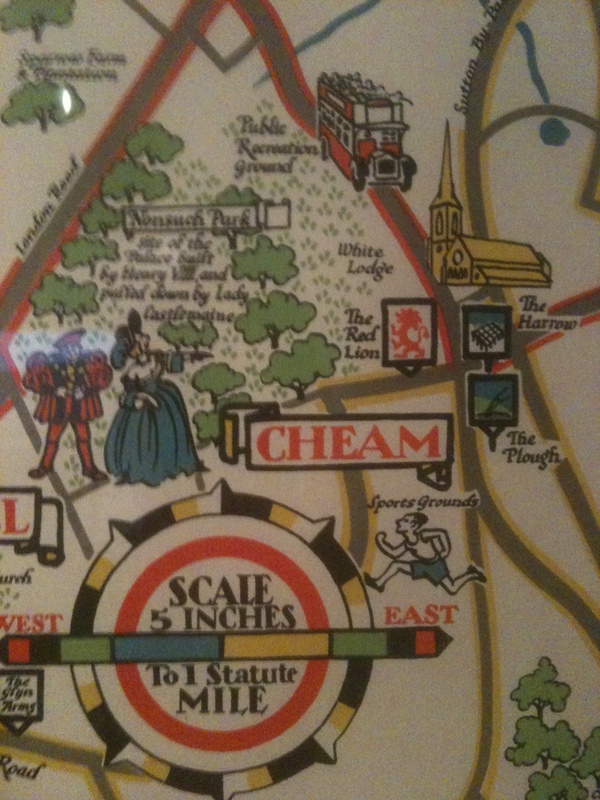 In this section there are other decorative maps that were used by LT to promote different areas of London. Here is one featuring Cheam, where I grew up. The Beck part of the exhibition is also brilliantly done given how much has already been done on the man who created the modern tube map. 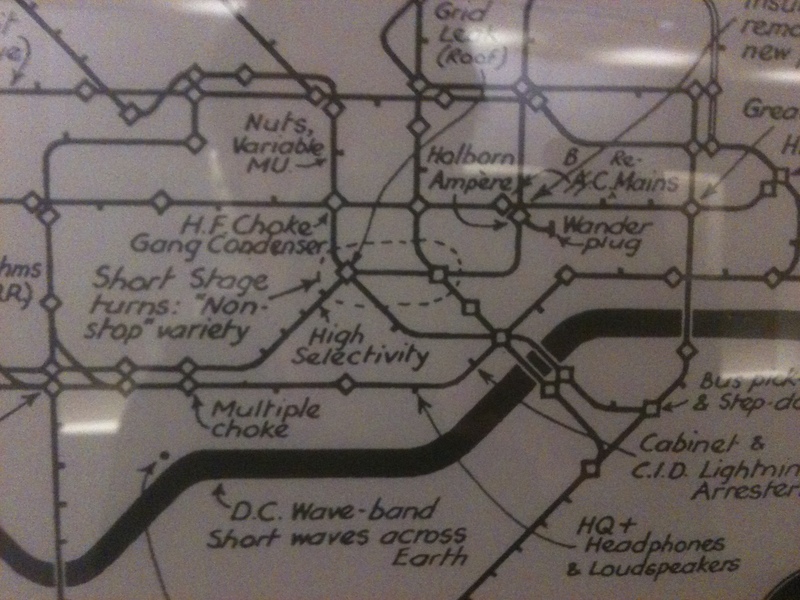 A personal highlight was this sketch from the London Transport staff newspaper in 1933, in which Beck gently mocks the popular notion that he got the idea for his diagrammatic map from a circuit board. He has redrawn his tube map as the interior of a transistor radio, thus creating the first mash-up/spoof of his iconic design and pre-dating The Great Bear by several decades. Speaking of which, the LT Museum have commissioned six new pieces of art for the exhibition, and they are all great, which is quite unusual for these things. Simon Patterson has updated The Great Bear as Saptarishi, Jeremy Wood has created a new ghost map, tracing his movements through GPS and there’s a marvellous ‘Proustian’ map of London by Agnes Poitevin-Navarra. Most exciting of all is Stephen (The Island) Walter’s new epic undertaking, London Subterranea, a stunningly detailed map of the London beneath our feet, executed in stark black and white and crammed with information and folklore. When I talked to Walter a few years ago, he expressed a keenness to put The Island behind him despite some interesting related projects that had been suggested to him. I’m delighted that he has since decided to return to London mapping, as he is a master at it. I’m told he’s now working on an A-Z, which will incorporate The Island and London Subterranea. Other highlights include a copy of the infamous 2009 tube map that omitted the Thames, a gorgeous 1932 enamel map from a station wall and a copy of Finchley Central by The New Vaudeville Band. There’s also a brilliant book by curator Claire Dobbin that accompanies the exhibition. Go see it! Mind The Map opens 18 May until 28 October 2012.